I am preparing a write up of these early events, which resulted from the first public demonstration of Mediumship in the Corinthian Hall Rochester NY State, using contemporary reports by Capron and Barron and Samuel Britten both written in 1850. The Capron and Barron report is explicit about the fact that this was between 14th and 17th November 1849 and Newspaper reports support this. Unfortunately Britten, talking in November 1850, refers to two years ago and then Leah Fox's Missing Link was written and in this the 1848 date is quoted. This is another of the major problems that Leah has created for us both in the information she gave Robert Dale Owen in 1859 and in this book. Quite creatively in the Missing Link she also adds a story of levitating tables of food to the events, very romantic, but which has no foundation in any record of the time. You will find the romanticism of the levitating dinner tables and another of Leah's probable creations Mr Splitfoot quoted almost universally in all subsequent versions of the start of Spiritualism. It is rather sad that such a clear error feeds into our own record of a philosophy based upon truth. Rochester library did not help, as I believe that around the August of 2008 they had a display stating the first demonstration was in 1848. Unfortunately their 1941 almanac, produced by the Rochester Historical Society, showed that incorrect date, indeed the same almanac has a further entry back in June which highlights the error. This entry shows that Corinthian Hall was not opened until June 1849. A subsequent document by the History Society in 1959 about famous people of Rochester notes under an entry for Maggie Fox the correct date of November 1849. Below I quote the two source documents involved. Later on I will put up the complete contemporary reports given the importance of this event to Spiritualism. Almanacs were already many centuries old when first they came to Rochester, and yet so sensitive was their adaptability that they quickly took on the spirit and character of the Genesee Country. Brought as they were at first by the several streams of settlers who converged in this valley, the first local almanacs inherited something of the character of many of their earlier American predecessors; but within three decades following the appearance of its first almanac in 1820, Rochester was to make some noteworthy contributions in this field. ROCHESTER HISTORY, published quarterly by the Rochester Public Library, dis­tributed free at the Library, by mail 25 cents per year. Address correspondence to the City Historian, Rochester Public Library, 115 South Avenue, Rochester, N. Y. Being the 124th year since the Incorporation of Rochesterville. June-Don't neglect the first crop of hay. 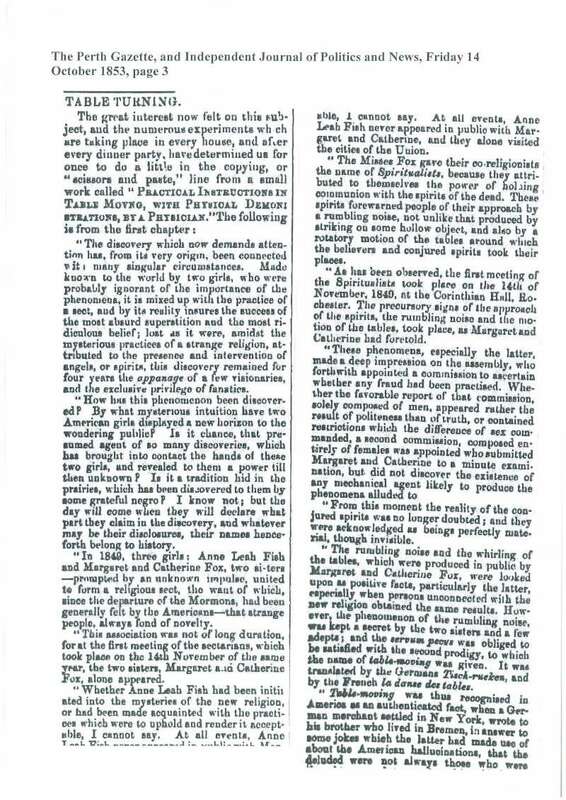 1 (1846) First press dispatch received by telegraph. 2 (1834) First city election. 3 (1919) First Community Chest Drive. 4 (1920) Section of Erie Canal through city formally abandoned. 5 (1817) First local Masonic Lodge formed. 6 (1920) First three boats arrive in new Barge Canal harbor. 7 (1825) Lafayette visits Rochester. 8 (1884) Semi-centennial celebration begins. 9 (1834) First mayor, Jonathan Child, elected by Common Council. 10 (1919) First chapter Gold Star Mothers of America formed here. 12. puddings by and by, you must look well to your cornfields." 13 (1910) Lase professional appearance here of Buffalo Bill. 14 (1902) Dedication of Spanish trophy gun in Highland Park. 15 (1841) First Board of Education elected. become Assistant Secretary of State. 17 (1935) Cornerstone of Rundel Memorial Building laid. 18 (1873) Susan B. Anthony convicted of illegal voting. 20 (1850) Second Court House begun. 21 (1844) Concert by Ole Bull, Norwegian violinist. 22 (1933) City Normal School graduates last class. 23 (1925) City Manager Charter submitted to Common Council. 24 (1895) General strike of buttonhole makers. 25 (1934) City flag adopted by ordinance. 26 (1893) Spanish caravels here on way to Chicago Exposition. 27 (1896) Third Court House opened. 28 (1849) Corinthian Hall opened. 29 (1896) Twenty thousand attend bicycle festival at Driving Park. 30 (1852) First train from Rochester to Niagara Falls. 1 (1935) Earthquake shock felt here. 2 (1896) City sees its first moving picture. 3 (1925) City Manager Charter adopted by referendum. 4 (1841) Auburn and Rochester Railroad opened. 5 (1872) Susan B. Anthony and 14 other women vote in 8th Ward. 6 (1829) Sam Patch successfully jumps over Falls. 7 (1918) False armistice celebrated. 8 (1803) Mill lot purchased by Rochester, Fitzhugh, and Carroll. 9 (1825) First dramatic performance in Exchange Street "Circus." 10 "Prepare for winter, lest it come upon you like a thief in the night." 11 (1918) City Hail bell rings out armistice news at 4 A. M.
12 (1789) Supposed date of raising of Indian Allen's grist mill. 13 (1829) Sam Patch's fatal jump. 15 (1935) Alan Valentme inscalIed as presIdent of Umverslty. 16 (1891) Relay bicycle race from Rochester to Buffalo. 17 (1887) Compulsory education discussed at meeting here. 18 (1925) Brick Church celebrates centennial. 19 (1812) Abelard Reynolds appointed first postmaster. 20 (1811) First lot in 100.Jcre tract sold to Enos Stone for $50. 22 (1921) Subway construction authorized by Council. 23 (1885) Mechanics Institute opened. 24 (1848) Whigs celebrate victory with great "illumination." 25 (1940) Fire destroys three buildings on Main Street Bridge. 26 (1868) Demonstration of plowing by steam. 27 (1901) Annual Thanksgiving dinner for newsboys and bootblacks. 28 (1908) Germans unveil statue of Schiller in Anderson Park. 29 (1894) Rochester beats Hobart in Thanksgiving Day game here. 30 (1866) First annual "donation" at City Hospital. A recent request for a list of Rochester women whose careers merit recognition in a projected Biographical Dictionary of American Women prompts a fresh review of the field. At least a dozen women and over one hundred men, who were iden­tified more or less closely with this city, appear in the Diction­ary of American Biography or in the National Cyclopedia of American Biography. Who's Who in America included 38 from Rochester in its first issue in 1899-1900 and increased that figure to 120 by 1934-1935 and to 152 in 1952. Most of the last are still with us, and some of the others were so briefly resident in the city that it is scarcely appropriate to claim them as Rochesterians. But in this State Year of History it may prove of interest to assemble an alphabetical list of former residents who did major work here or who acquired their distinctive character and inspiration in this city. ROCHESTER HIS'fORY, published quarterly by the Rochester Public Library, dis­tributed free at the Library, by mail 25 cents per year. Address correspondence to the City Historian, Rochester Public Library, 115 South Avenue, Rochester 4, N. Y. "Eastman, George (1854-1932). Inventor-industrialist, George Eastman pioneered in the development of photographic film and cameras. Born in Waterville, N. Y., he came to Rochester as a lad with his parents and attended its public schools. Forced by the death of his father to seek a job, he acquired a keen appreciation of the value of money and quickly saw the com­mercial possibilities in his photographic hobby. His success in perfecting a practicable "dry plate" led to patents on its for­mula, on a coating machine, on a Kodak and progressively on a flexible film for still and motion and color pictures. The vigorous leadership he gave to the development of his company prepared him for similar service in educational and other com­munity fields. His philanthropy began with the support of schools of practical technology and expanded rapidly after 1910 to include hospitals and dental clinics, musical instruction and performance, and finally all the liberal and fine arts of a rounded university. Always interested in efficiency, he helped to establish bureaus and research centers to promote high civic and economic standards. BEFORE speaking of the strange phenomenon, thought by some to be much stranger than the "rapping" or the intelligence manifested through the medium; we give an account of the public investigations which were gone into in the city of Rochester in the month of November, 1849. The first intimation that was received in regard to those investigations came from these sounds, through the use of the alphabet. Several persons were in company, trying, as usual, to gain some information in regard to the law which governs this strange communication. While they were thus investigating, the following was spelled out by the use of the alphabet, it being part of the message or directions for those present to follow. "You all have a duty to perform. We want you to make this matter more public." As this announcement was altogether unexpected, the persons began to discuss the difficulties, and remarked that the opposition and ridicule, that would be heaped upon anyone who should attempt to lecture on this subject, would be almost overwhelming. The answer to this was, "That will be so much the better - your triumph will be the greater." forward in the matter - the persons who were designated concluded to make the attempt. It was also intimated, from the same source, that this would prepare the way for a more general development of spiritual communication, which would take place at no distant day. Probably the best idea of the proceedings at Rochester can be conveyed to the reader by the following brief statement drawn up and published directly after the investigations took place, in the New York Weekly Tribune of Dec. 8th, 1849. "Some two weeks since, we were in company with some persons who were getting communications from this invisible communicator when a mes­sage was spelled out to us to the Import that the matter should be made more public- that the time had arrived for the people to investigate the whole affair - that it was a thing which will ultimately become known to all men, and that we should immediately take measures to have it investigated. The directions were then minutely given by these spirits, as they purport to be, and which we are willing to believe are, until we have as much proof to the contrary as it required to bring us to that conclusion. These directions will appear in the following history, as they were fully and strictly followed. The great object was to start investigation and clear those who had been hearing of it for the last two years from the imputation of fraud and deception. Accordingly on the evening of November 14, a lecture was delivered in Corinthian Hall in the City of Rochester, and a full history of the rise and progress of these manifestations given. During the relation of these facts the sounds were distinctly heard by the persons in the Hall. After the lecture, a Committee was chosen by the audience, composed of the following persons--A. J. COMBS, DANIEL MARSH, NATHANIEL CLARK, ESQ., A. JUDSON AND EDWIN JONES. 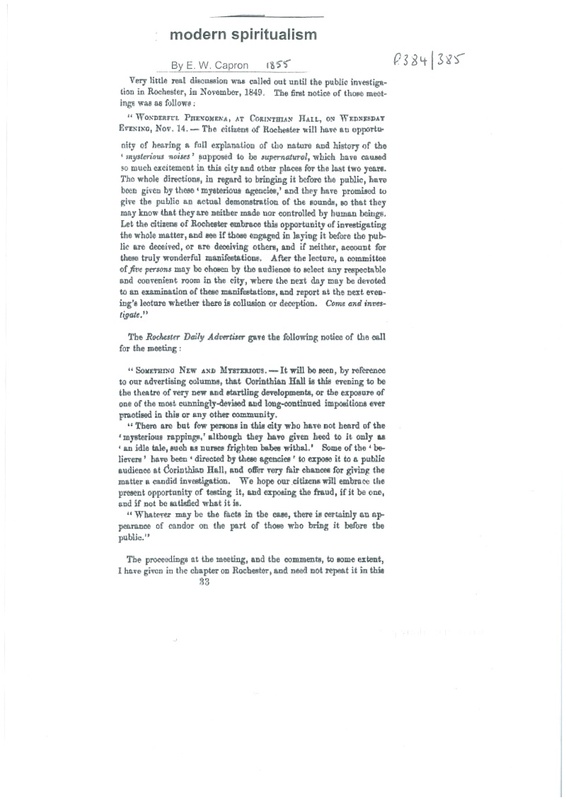 On the following evening the Committee reported in substance, as follows: That without the knowledge of the persons in whose presence the manifestations are made, the Committee selected the Hall of the Sons of Temperance for investigation - that the sound on the floor near where the two ladies stood was heard as distinctly as at other places, and that part of the committee heard the rapping on the wall behind them-that a number of questions were asked which were answered, not altogether right nor altogether wrong -that in the afternoon they went to the house of a private citizen, and while there the sounds were heard on the outside (apparently) of the front door, after they had entered, and on the door of a closet. By placing the hand upon the door, there was a sensible jar felt when the rapping was heard. One of the Committee placed one of his hands upon the feet of the ladies and the other on the floor, and though the feet were not moved, there was a distinct jar on the floor. On the pavement and on the ground the same sound was heard:-a kind of double rap, as a stroke and a rebound, were distinguishable. When the ladies were separated at a distance no sound was heard; but when a third person was interposed be­tween them the sounds were heard. The ladies seemed to give every opportunity to the Committee to investigate the cause fully, and would submit to a thorough investigation by a committee of ladies if desired. They all agreed that the sounds were heard, but they entirely failed to discover any means by which it could be done. After this report and some discussion on the subject, the audience selected another Committee composed of the following persons-Doctor H. H LANGWORTHY, Hon. FREDERICK WHITTLESEY, D. C. Mc CALLUM, WILLIAM FISHER, of Rochester, and Hon. A. P. HASCALL, of Le Roy. At the next lecture this Committee reported that they went into the investigation at the office of Chancellor Whittlesey, and they heard the sound on the floor. on the wall, and door,- that the ladies were placed in different positions and, like the other Committee, they were wholly unable to tell from what the sound proceeded or how it was made, that Dr. Langworthy made observations with a stethoscope to ascertain whether there was any movement with the lungs, and found not the least difference when the sounds were made; and there was no kind of probability or possibility of their being made by ventriloquism as some had supposed - and they could not have been made by machinery. In the evening the Committee, through their Chairman, Dr. Langworthy, made a very full report of their examinations during the day. They reported they excluded all friends of the two ladies from the committee room and had the examination only in presence of the Committee of Gentlemen, and Ladies chosen by them. Notwithstanding all this precaution, these sounds were heard when the ladies stood on large feather pillows, without shoes, and in other various positions, both on the floor and on the wall, -­ that a number of questions were asked which, when answered, were generally correct. Each member of the Committee reported separately agreeing with and corroborating the first statements. Thus, by three days of the strictest scrutiny, by means of intelligence, candor and science, were the persons in whose presence these sounds are heard, acquitted of all fraud. On Friday evening, after the lecture, three of the Committee, viz: Hon. A. P. HASCALL, D. C. MCCALLUM, and WILLIAM FISHER, repaired to the house of a citizen and pursued their investigations still farther. There were nearly a score of persons present. The members of the Committee wrote many questions on paper, which no person present knew the purport of, and they were answered correctly. At times they would ask mentally and would receive the answers with equal correctness and they were fully satisfied that there was something present manifesting intelligence beyond the persons visible. .
One of the Committees tried the experiment of standing the ladies on glass and failed to get any sounds; but the same was subsequently tried in presence of a large number of persons, and the sounds were as loud and distinct as before, on the floor as usual. but a small part of these strange occurrences with the Committee's report greatly condensed. Thus the matter stands at present, and whether it is a remarkable phenomenon which will pass away with the present generation, or with the persons who seem now to be the medium of this extraordinary communication; or whether it be the commencement of a new era of spiritual influx into the world; it is something worthy of the attention of men of candor and philosophy. E. W. CAPRON, Auburn. GEORGE WILLETS, Rochester,"
As one of us was present and acquainted with all the circumstances we will make some further statements in regard to the events that transpired during the week of the investigation. Each of the committee, after the report of their chairman; were called upon to make a report individually and what is unusual where any doubtful matter is under consideration, every individual agreed to all that is published in the above extract. Some individuals of the committee made more minute reports of questions and answers and other circumstances that came under their observation during these examinations. One member of the first committee stated that he asked the question. "Who is it that wishes to communicate with me" The answer was, "your wife will talk." He evaded the answer, and gave the persons present to understand that he never had a wife. To use his own expression when he gave his public report, he "brow beat it down." He would not admit there was any truth in it until he reported in the evening - then he stated it correctly - he had lost his wife sometime before. persons persist in denouncing those who even go to hear for themselves as fools or knaves! We insist upon it, that those who were present at Corinthian Hall, and had a voice in the appointment of those committees, selected from the best and most reliable men of the city of Rochester, should of all men be the last to cry humbug or collusion. They must be aware that in doing this they impeach their commit­tees, and indirectly accuse them of being ignoramuses and incapable of impartial investigation, or of being ac­cessory to one of the most successful, widespread and long continued impositions ever palmed off on this or any other community. When we take into consideration the facts that this matter has now been spreading for two years - that every means have been tried in private circles, and com­mittees appointed by public meetings - that all have failed to discover any thing like collusion - we may safely assert that in regard to the sounds merely -- the following facts are established beyond dispute, viz: That the sounds are heard in various places and at various times - that those sounds are not made by, or under the control of any person or persons, although manifested in the presence of particular persons; and that they evince a remarkable degree of intelligence. These facts, among those who have carefully investigated are no longer disputed. I have E.W. Capron's book "Modern Spiritualism" published in 1855 is a record of the beginnings of Modern Spiritualism and is a 'must' for students of the history of Spiritualism. It's 438 pages, Jim, and quite small print! Hi Z then clearly I will need to buy new glasses as well, its interesting I have read some early material involving Capron and seen a bit of the book you mention and noted some things that may seem inconsistent. I look forward to eventually receiving the book so I can look at it in detail. Given the real importance of Corinthian Hall as both the first public demonstration and the first independent, hostile investigation which validated the reality of communication I find this early, very real material vital. It is especially important because of the extra dramatisation of Leah's later work which over emphasises her own importance. As an extra diversion I discovered that news of the events at Corinthian Hall filtered down to our Antipodean Lands. Strangely the only news archive I can find was, from all places, out of Western Australia. I say strangely because the article is from 1853 and WA was only founded in 1829 (7 years before South Australia was settled, SA is one where only free settlers came to), also because the greatest level of Spiritualist Activity was in Melbourne Victoria where the Victorian Spiritualist Union is the oldest continuously operating Spiritualist organisation in the world starting in 1870. Anyway here is the article, typical of most newspapers of that time (and even this time) the article denigrates the whole idea of Spirit contact despite the admission that the Committees never found anything to show any fraud whatsoever. I have also been looking at Caprons 1855 book and note unfortunately that in printing, although every other reference, in his earlier 1850 pamphlet and even in the closing appendix, reinforces teh correct year 1849 the write up on Rochester says 1848 in error (remember as above Corinthian Hall only opened in 1849). The appendix does include the notices published in Newspapers and a letter of complaint by a member of teh public about the unruly behavior of the mob. It is fascinating that despite the eminence of the people on the Committees, the level of hostile investigation and the reports that exonerated any fraud the general populace refused to accept other than they were imposters. Transatlantic Tracings by John Ross Dix, United States - 1853 CHAPTER XIV. A SPIRIT-RAPPING SKETCH — WITH NOTICES OF MILLERISM—MAGIC—AND " WOMAN'S RIGHTS." That Brother Jonathan is, as he terms himself, "tarnation cute," no one, I imagine, will be hardy enough to deny; but, it is also a fact, that he is to the full as gullible as John Bull himself is said to be. Every two or three years the Americans have a paroxysm of humbug—now it is Mormonism—now Millerism, and at the present time it is Spiritual-ism. Every one must have heard of the Spirit- Rappings which are at present all the rage in America. You can go into no society but you will find it the principal topic of conversation and into very few communities where there are not believers in the "manifestations-" as they are termed. I had heard so much, and read so much on this all-absorbing theme, that I anxiously looked for an opportunity of witnessing for myself the miracles alleged to be performed,—one was soon afforded me. Several years have now elapsed since the societies of communist celibate ascetics, calling themselves "Christian Friends," but commonly designated " Shakers," professed to be in the direct receipt of almost daily communication from "the spirits of the just made perfect." This claim attracted very little attention. It was quite generally deemed (as it still is) only a natural outgrowth or development of the fanatical folly and knavery which (at least in the popular estimation) form the bases of Shakerism. Two or three German books, of which "The Seeress of Prevorst" is the most remarkable, were reprinted here about the same time, and excited some interest among the curious. Except by those having a strong tendency to mysticism, however, they were regarded as far more indebted for their origin to German beer- drinking, tobacco-smoking, and opium-eating than to any inlet from the Spirit World. Finally, during the summer and autumn of 1849, it began to be whispered about that communications from the spirits of the departed bad been and were being received in the city of Rochester, New York—the alleged "mediums" being three sisters, Mrs. Ann Leah Fish, and Misses Margaretta and Catherine Fox, the two latter then some fifteen and thirteen years old. At length, on the 14th of November, 1849, in accordance, as was said, with directions from "the spirits," a public lecture on the origin and character of the alleged "Spiritual Manifestations" was given in Corinthian Hall, Rochester, at which the " mediums" were present. "Manifestations" were had, and a Committee , was chosen from the audience to report upon their nature and origin at an adjourned meeting the next evening. That Committee in due time reported that they had made such investigations as they thought proper in the presence of the " mediums," at a place with which these persons were previously unacquainted, and where they could have made no preparations for juggle or deception—that the answers given by the alleged "spirits" to their questions, were partly correct and partly otherwise—that the "mediums" had apparently given every facility for the investigation; but that the Committee had utterly failed to discover how the mysterious sounds or " raps" were produced, or what was their cause or origin. The adjourned public meeting, after some discussion, selected another Committee, consisting of five well-known and respected citizens, including three of social and political eminence, who made a further investigation in another place, with substantially the same results. Hereupon a third Committee was appointed, who appointed a sub-committee of ladies, who took the "mediums" into a private room of a hotel, to which they were strangers, disrobed and searched them, to be certain that no machinery or fixtures were concealed beneath their dresses whereby the mysterious sounds were produced. The "mediums" were then made to stand on pillows, with handkerchiefs tied tightly around their ankles; but all in vain. The "raps" were repeated, and intelligent answers to unpremeditated questions were thereby given. A physician had previously applied a stethoscope to the breasts of the "mediums," in order to be sure that the sounds were not made by ventriloquism. He reported that no movement of their lungs or chests was perceptible when the sounds were heard. 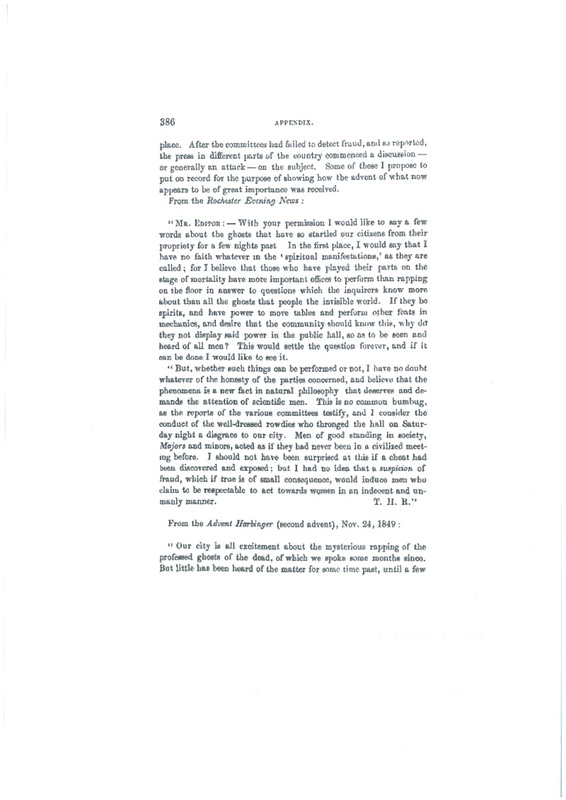 At the first trial of standing the "mediums" on glass, no sounds were perceived; but the experiment was repeated, and the "raps" were heard as usual. At one of the meetings for investigation, the Committee excluded all persons but themselves and the "mediums," in order to preclude the chance of collusion by unsuspected outsiders. At one meeting, members of the Committee wrote their questions privately, so that the "mediums" could not know (by any ordinary means) what was their purport; and yet the replies to them, by "raps," were said to have been given correctly. So with regard to mental questions (Admin, i.e. questions formed in the mind of the committee and answered correctly by the mediums). On these points, however, no reports were made by either Committee as such. Their formal scrutiny was limited to the single point of detecting the trick or juggle in which the "raps" were presumed to originate ; and on this point their reports were unanimous, that every facility for investigation was proffered them, and that no cheat could be detected. Thus far, and so long as the "Manifestations" were confined to " the Fox family," the evident presumption necessarily was that the " mediums" were exceedingly clever impostors. Their story imported that the "rappings" had been first heard in their humble rural dwelling at the little hamlet of Hydesville, township of Arcadia, Wayne County, state of New York, some two years ago, and while that dwelling was occupied by another family—that they ceased after a while, and were not heard again until March, 1848, (the family of Mr. John D. Fox having occupied the house since the preceding December-)—that they very naturally excited alarm and terror in Mr. F 's family, and induced them (on the evening of the 31st of March), first to call in their neighbours to counsel and encourage them in the presence of these unaccountable noises, and that the first indication of intelligence in the sounds were given them a few days before, in consequence of the youngest daughter, (then twelve years old) attempting to imitate the mysterious " rappings" by snapping her fingers, when the " raps" immediately repeated the number of distinct sounds made by her, and proceeded to " rap" five, six, or any given number of times, as requested ; then to toll the age of any one present by giving a rap for each year, if desired, &o., &o., until a very tolerable telegraphic communication with the invisible cause of these perturbations was established,—that the noise followed the greater portion of the family on their removal to Rochester, and that the telegraph was gradually improved by the employment of the alphabet: the "medium," or some one else present, calling over the letters in succession until a "rap" indicated that the right one had been reached, when the said letter was jotted down, and the alphabet called again, and so on until the "rap" ceased, when the letters already set down were divided into words, and the sentence thus obtained received as a communication from behind the curtain, foe., &c. All this, though apparently straightforward, and corroborated by neighbourhood testimony, would hardly have attracted attention outside of a narrow circle, or been regarded by any considerable number as other than the specious web of falsehood wherein the preconceived imposture had enveloped itself. ""The first lecture explanatory of the spiritual philosophy, and especially of the marvellous circumstances which heralded in the spiritual dispensation of the nineteenth century, was delivered at the Stuyvesant Institute, Broadway, New York City, in November, 1850, by the Rev. S. B. Britain, better known in the American Spiritual ranks as Professor Britain. I must now notice the solution which we have been privileged to receive to all our spiritual problems in the famous “Rochester Knockings,” or first spiritual telegraph, worked through the instrumentality of the renowned Fox Sisters, who have so recently visited our city. From the first report of this marvellous phenomenon I have been a persistent and careful observer. I have conversed with those who were present at the Corinthian Hall investigations two years ago, when committees of the best citizens of Rochester were appointed to test the manifestations by day and report to the public in great mass meetings each night. I positively know that all these committees were composed of men antagonistic to the spiritual hypothesis, yet every one of them each night—and that in defiance of howling mobs—resolutely declared that they had received, through the rappings each day, names, dates, and intelligence, which could be known only to the buried dead. I have conversed with the gentlemen who have introduced these mediums to the public, and I learn from the most indisputable testimony that the Fox Sisters have been tested, and their truth, and honesty proved, by every conceivable means. They have been searched by committees of ladies, and their clothing to the last under garment changed. Still the raps have come, and the same intelligence rendered. They have been placed upon glass supports, and pillows; dressed in silk, and at the last Rochester public meeting tied hands and feet, and thrown on the platform like bales of goods. And whilst pitch and tar was burning in the street outside the hall, and a savage mob waiting to lynch the mediums and the committee appointed to investigate them, should they still persist in the spiritual hypothesis, that committee DID PERSIST in reporting that the intelligence rendered during the day could have come from none others than spirits, and even then through those mediums on the platform, bound hand and foot, pale, trembling, and threatened with instant outrage and lynching, loud raps, confirmatory of the committee’s reports, were heard from end to end of the vast hall." It would be impossible to follow the subject through its various phases, and give any great portion of the articles for and against the spirituality of the manifestations, up to the present time. The days of angry disputation are passed. The frenzy of disturbed bigotry has subsided. The manifestations have become so common as to be longer a wonder. The quiet of a calm conviction has settled upon a million of spiritualists; and new converts, although daily added, cease to attract attention. The foundation on which belief rests is stubborn facts, and no religion ever spread with such unprecedented rapidity, and none has ever rested on such positive foundation. But six years have passed by since the humble dwelling at Hydesville was made the centre of attraction for a continent, and now the occurrences, then confined to that locality, are known throughout the civilized world. The good it will accomplish, the design of its appearance, and the form in which it will continue are all subjects for future history. ...and here we are living in that 'future history'!! Of course I added to this and wrote the Psychic News article that was printed on the 150th Anniversary of this crucial event. Thanks for the info here. Will wait for that one.